I discuss a number of news stories and trends coming out of Art Basel Miami at The L Magazine. The teaser below. 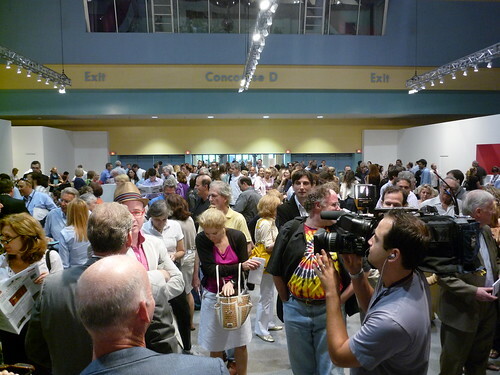 When I first started writing about art fairs, I was more naive than I’d like to admit. I mistakenly believed my trained eye would allow me to spot more valuable trends and news stories than anyone else. But with so many dealers to talk to and so much art to see, thousands of narrative threads spin from these events and only a few recur enough times to make a definitive statement. And even then, many are suspect. Take the dead icons fair trend at Art Basel Miami this December, as identified by countless twitterers and newspapers: Michael Jackson appeared a lot at Basel this year according to these sources, but I only noticed three instances at the main fair and two at Art Miami. There are probably more than I noticed, but it seems likely that pop power of these icons distorted the degree of emphasis on repetition, and drew attention to the trend. After all, the numbers are only slightly more frequent than Wade Guyton’s U sculptures, which were located in a post by Greg Allen earlier this week.